The last few days I’ve had the grands over night while their mom and dad are in Cabo San Lucas. I thought they’d enjoy an Oreo Cookie Ice Cream Pie and decided to whip up a couple for them. Now normally I like to make recipes from scratch but I needed something fast and easy for these two young-uns so I broke down and used store bought ingredients to make the pies. It’s kinda hard to screw up an ice cream pie. No matter what it looks like, it’s still gonna taste good! 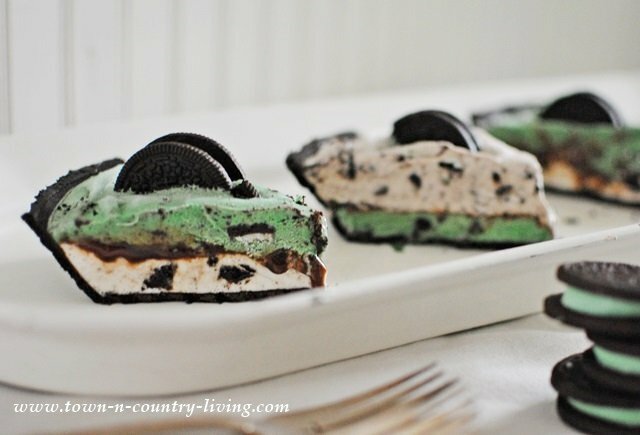 I decided to layer my ice cream pies with 2 flavors of Oreo ice cream. Start with your ingredients … ice cream, cookie crusts, fudge topping, and cookies for decoration. 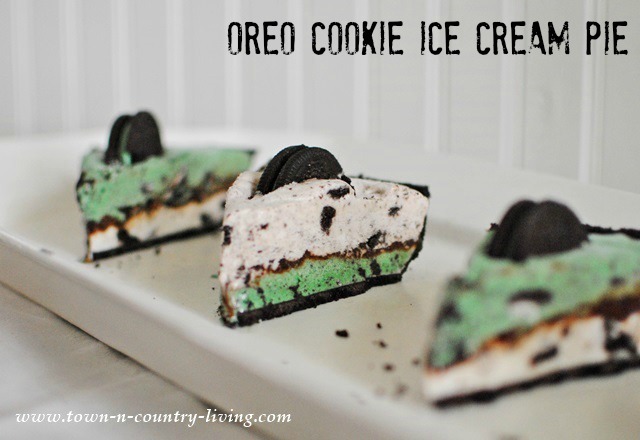 After softening the ice cream, I spread mint oreo cookie ice cream into the bottom of the crust then put it in the freezer until hard. Next I added warmed-up chocolate fudge sauce in a thin layer. Freeze again. 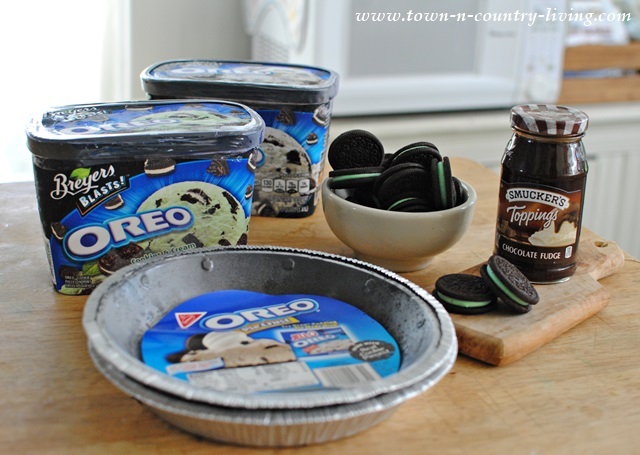 Then add a layer of regular oreo ice cream on top. For the second pie, I simply flip-flopped the layers … regular flavor on bottom and mint on top. Then decorate your pies however you want. I cut the cookies in half and placed them on top. Freeze your pies one more time and when frozen through, you can cut and serve. The grands loved their Oreo Cookie Ice Cream Pie! TIP: The pies are easier to cut if you freeze overnight before serving! Freeze the pie crusts for at least 20 minutes. Soften the ice cream by leaving it out at room temperature for about 15 minutes. 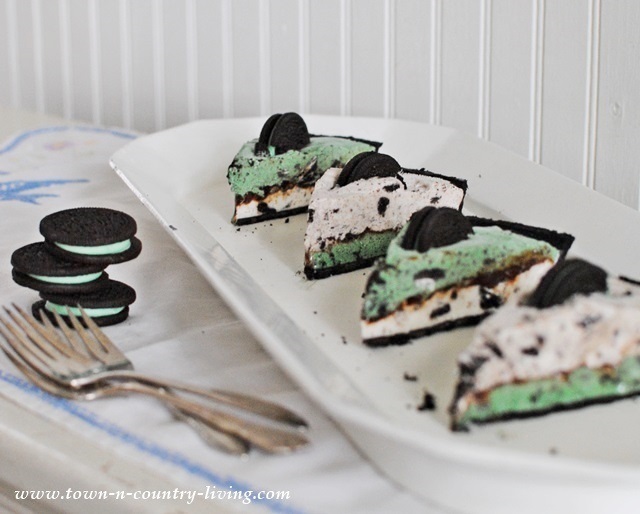 Take crusts out of freezer and fill one half-way with Mint Oreo ice cream and the other with regular Oreo ice cream (you can stir ice cream to further soften it before spreading on pie cookie crust, if needed). Cover half filled pies and place back in freezer for at least 30 minutes, along with the remainder of the ice cream quarts. Remove pies from freezer and spoon slightly warmed up chocolate fudge sauce over the first layer of ice cream (I microwaved the sauce for 30 seconds). Cover and place back in freezer for at least 30 minutes. Remove the ice cream quarts from freezer and let them soften for about 15 minutes. 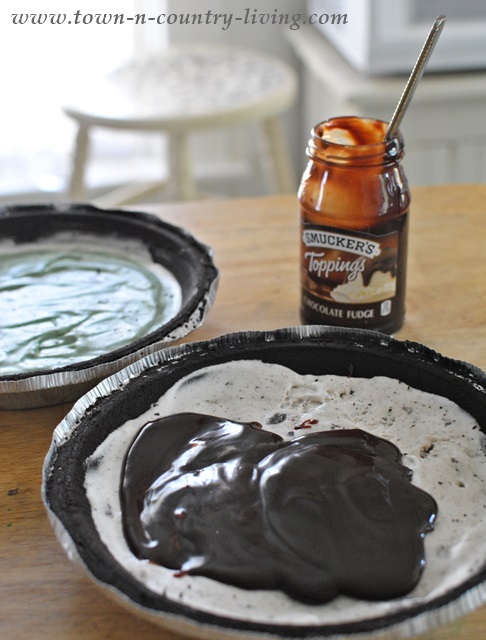 Remove pies from freezer and add a second layer of the other ice cream over the layer of fudge sauce. 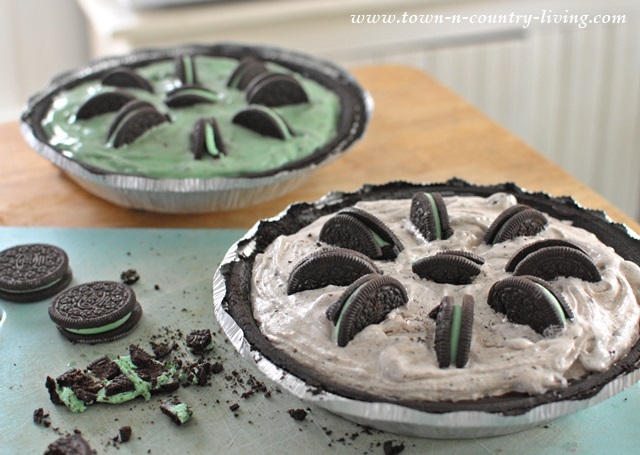 Decorate with halved oreo cookies or crush the cookies with a rolling pin and sprinkle over the tops of pies. Cover and place in freezer for at least 30 minutes before serving. *I added a few drops of green food color to the mint-flavored ice cream in a separate bowl to make it a bit greener. You had me at ice cream! YUMMY!! What a great summer dessert! Yum! I’m totally trying this soon, thanks!